Jet lag, also called desynchronosis or jet lag disorder, is a temporary sleep problem that can affect anyone who quickly travels across multiple time zones. Your body has its own internal clock, or circadian rhythms, that signals your body when to stay awake and when to sleep. Jet lag occurs because your body's clock is still synced to your original time zone, instead of to the time zone where you've traveled. The more time zones crossed, the more likely you are to experience jet lag. 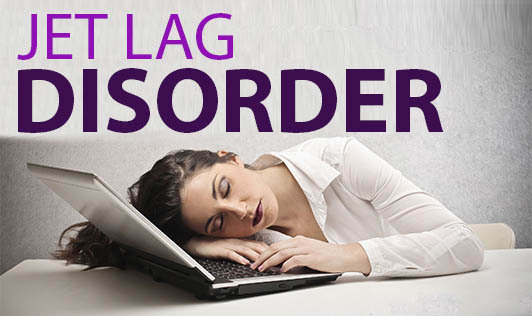 Jet lag can cause daytime fatigue, an unwell feeling, difficulty staying alert and gastrointestinal problems. Jet lag is temporary, but it can significantly reduce your vacation or business travel comfort. Fortunately, there are steps you can take to help prevent or minimize jet lag. Jet lag can occur anytime you cross two or more time zones. Jet lag occurs because crossing multiple time zones puts your internal clock or circadian rhythms, which regulate your sleep-wake cycle, out of sync with the time in your new locale. A key influence on your internal clock is sunlight. That's because light influences the regulation of melatonin, a hormone that helps synchronize cells throughout the body. Certain cells in the tissue at the back of your eye (retina) transmit the light signals to an area of your brain called the hypothalamus. At night, when the light signal is low, the hypothalamus tells the pineal gland, a small organ situated in the brain, to release melatonin. During daylight hours, the opposite occurs, and the pineal gland produces very little melatonin. You may be able to ease your adjustment to your new time zone by exposing yourself to daylight in the new time zone so long as the timing of light is done properly. Some research shows that changes in cabin pressure and high altitudes associated with air travel may contribute to some symptoms of jet lag, regardless of travel across time zones. In addition, humidity levels are low in planes. If you don't drink enough water during your flight, you can get slightly dehydrated. Dehydration may also contribute to some symptoms of jet lag. Number of time zones crossed. The more time zones you cross, the more likely you are to be jet-lagged. Flying east. You may find it harder to fly east, when you "lose" time, than to fly west, when you gain it back. Being a frequent flyer. Pilots, flight attendants and business travelers are most likely to experience jet lag. Being an older adult. Older adults may need more time to recover from jet lag than do younger adults. Arrive early. If you have an important meeting or other event that requires you to be in top form, try to arrive a few days early to give your body a chance to adjust. Get plenty of rest before your trip. Starting out sleep-deprived makes jet lag worse. Gradually adjust your schedule before you leave. If you're traveling east, try going to bed one hour earlier each night for a few days before your departure. Go to bed one hour later for several nights if you're flying west. If possible, eat meals closer to the time you'll be eating them at your destination. Regulate bright light exposure. Because light exposure is one of the prime influences on your body's circadian rhythm, regulating light exposure may help you adjust to your new location. In general, exposure to light in the evening helps you adjust to a later than usual time zone (traveling westward), while exposure to morning light can help you adapt to an earlier time zone faster (traveling eastward). The one exception is if you have traveled more than eight time zones from your original time zone, because exposure to light in the early morning could be mistaken by your body as dusk. Conversely, evening light might be interpreted as dawn. So, if you've traveled more than eight time zones to the east, wear sunglasses and avoid bright light in the morning, and then allow as much sunlight as possible in the late afternoon for the first few days in your new location. If you have traveled west by more than eight time zones, avoid sunlight a few hours before dark for the first few days to adjust to the local time. Stay on your new schedule. Set your watch to the new time before you leave. Once you reach your destination, try not to sleep until the local nighttime, no matter how tired you are. Try to time your meals with local mealtimes too. Stay hydrated. Drink plenty of water before, during and after your flight to counteract the dehydrating effects of dry cabin air. Dehydration can make jet lag symptoms worse. Avoid alcohol and caffeine, as these can dehydrate you and affect your sleep. Try to sleep on the plane if it's nighttime at your destination. Earplugs, headphones and eye masks can help block out noise and light. If it's daytime where you're going, resist the urge to sleep.